There’s a new record from Dark Sunny Land and one due soon from Weasel Walter & Chris Pitsiokos. One Hand release #2 is here. We couldn’t be happier that we persuaded one of our favorite–make that favorite–NYC-based (or at least half NYC-based) rock outfit to give us some music. This thing is a beast, an unrelenting storm of sound, mostly guitars, that starts with a fury and maintains it ’til the final note. Nods to Skullflower and Haino and the like are in there, but Fadensonnen have evolved into their own thing, and hopefully won’t be NYC’s best kept secret for much longer. The packaging, a Fadensonnen labor-of-love, is awesome–the cover is a silk-screened, meticulous hand-drawn horror scene, and inside there’s a paste-on insert with spine. Hand numbered edition of 150. We already have raves from Volcanic Tongue and Black 2 Comm, check ’em out on the link below. Otherwise, in the US, spend your money at the top notch distributors Fusetron or Little Big Chief, at Aquarius in San Fran, and Weirdo in Cambridge, MA. If you’re in the UK, or elsewhere in Europe, please buy from Volcanic Tongue. One Hand is excited to release the forthcoming Fadensonnen LP sometime in Spring 2014. It promises to bulldoze anything in its path. Got one of the micro private press monsters of the year here, Dark Sunny Land aka Steve Painter’s edition of only 150 hand-numbered psych/zone masterpiece, Emanations For A Returning: right from the classy weirdo/kraut sleeve this one comes over as a broadcast from deep within the zone that knows, with four extended, elegiac movements through a blurry/blissed out void of guitar, F/X, keyboards, theremin, singing bowls, recorder, assorted percussion and household objects that touches on classic Euro communal wipe-out ala Kalacakra, Yatha Sidhra, Popol Vuh et al but dredged through a modern loner/drone mindset. Indeed, a buncha heads have been raving about this album, guys like Chris Stigliano of Black To Comm, and it sits just right, with massive pools of slow-dazzling tone float cut with enough tactile spuzz that it feels played more than generated. Indeed, there are nods at points to the kind of slow string mesmerism of Taurpis Tula circa Sparrows and even a little of the classical grace of William Basinski but throw in your favourite deep space/no zone ritualists – say, Taj Mahal Travellers – and you’re close to the kind of euphoric floating in space depths of this massive side. Lose yourself in here, very limited supply obviously but a future beast. Very highly recommended. 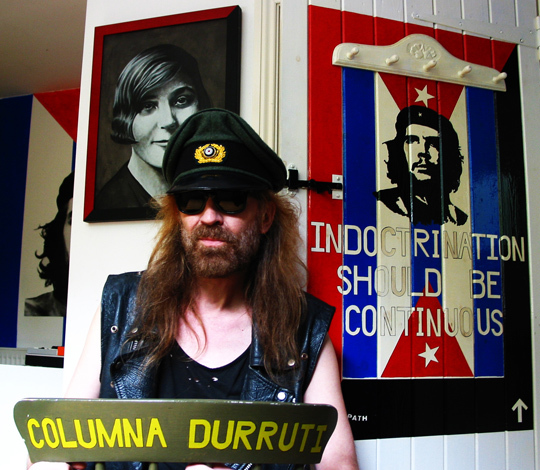 … for a longtime, the mighty Julian Cope, via his amazing Head Heritage website, has been a sort of all seeing mystic, well versed in the arcane arts of drone / metal / psych, and weirdly attuned to EXACTLY what we love. So knowing that Cope had flipped his lid for this, the debut from Dark Sunny Land, we were prepared to dig mightily, and were not disappointed. This Boston based one man outfit delivers a sort of dense psychedelic kraut-drone that balances somewhere right between the hushed guitarscapery of Stars Of The Lid, the abstract avant drift of Taj Mahal Travellers, and the soft noise blackened ambience of the best floorcore technicians. DSL weaves all of that into something heady and hypnotic, ritualistic and mesmeric, long tones blur into soft sheets of billowing feedback, synths and theremins drift and waver, melodies surface, and fragment before submerging beneath the softly undulating thrum, it’s the sort of ambient dronemusic that’s anything but tranquil and/or new agey, the sound here is dense and tense and rife with some sort of dark energy, while it may be hypnotic and mesmerizing, it’s also intense and aggressive, moody and atmospheric, but sinister and shot through with a sort of impending doom, whereas a lot of this sort of music drifts and floats ethereally, the sound of Emanations For A Returning sounds more like the soundtrack to a black hole, to collapsing universes, the score to the scorched expanses of dead planets, to a mysterious blackness that lurks in the shadows, it manages to sound like all that, while being breathtaking beautiful at the same time. Obviously so recommended! LIMITED TO 150 COPIES, and housed in super striking silk screened sleeves! 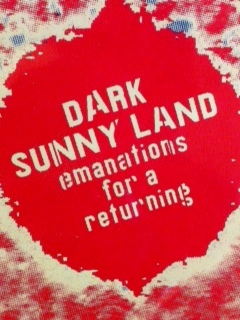 Dark Sunny Land Emanations For a Returning is ready for mass consumption … all 150 records that is. Get it now, duh! If you want to hear a track, direct your browser this way. The latest from Dark Sunny Land, Emanations for a Returning, will be available from One Hand Records hq in August. Over the last decade Boston’s Steve Painter, under various monikers, has quietly released a number of killer CDs on Gulcher that seemed to earn him high praise from the handful who heard them. Most enthusiastically touted by the great, long-running zine turned blog, Black to Comm, check out the fine interview with Steve Painter that appeared there. Emanations is four tracks of Painter’s uneasy, claustrophobic feedback and drone that are reminiscent of trailblazers Kluster and Taj Mahal Travelers. Painter calls his music “cranky ambient.” Recorded in the shadows of Fenway Park, this is an excellent late-night comedown listen. Emanations is the first Dark Sunny Land release to appear on vinyl. Silk screened covers. Edition of 150 copies.